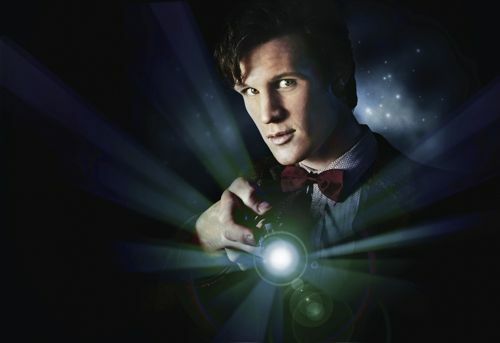 MATT Smith reflected: “To my mind, it’s the greatest part in British television. The world premiere in Cardiff last night of the latest Doctor Who series. 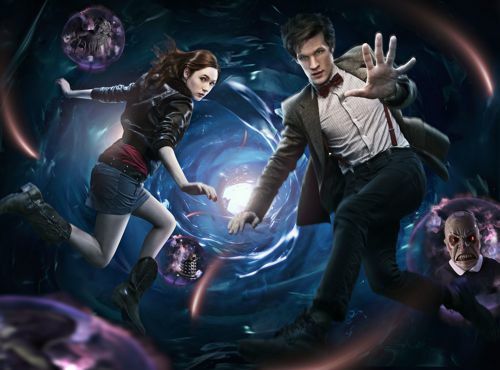 Featuring Matt in his full debut as the 11th Doctor and the Time Lord’s first meeting with new companion Amy Pond, played by Karen Gillan. Below is my transcript of the press conference that followed the screening of hour long The Eleventh Hour. To be broadcast on BBC1 on Easter Saturday. But first a quick review of some of what we saw without, hopefully, any major spoilers. I travelled to Wales with high expectations of Matt in the role. At 27, the youngest actor to take on the part. Even so, I was astonished at how good he was in possibly the best “debut” episode in the long history of Doctor Who. Some have already described it as a solid start and a building block for what is to come. So perhaps I’m wrong. And it’s only one opinion after all. We all see things in different ways. But what I saw was a dazzling, magical performance. And I wasn’t the only one with that opinion. David Tennant was, rightly, voted the greatest screen Doctor of all time. He remains a brilliant star in the Whovian universe. Yet by deciding to quit the role he loved, David has given us the gift of Matt Smith. A fresh, exciting, unpredictable and, yes, still mad Doctor. Like trading in your old, much loved, first car for a shiny, yet classic, new model. In odd moments, this Doctor’s voice reminded me of Oliver Postgate’s timeless audio commentaries for Noggin The Nog. 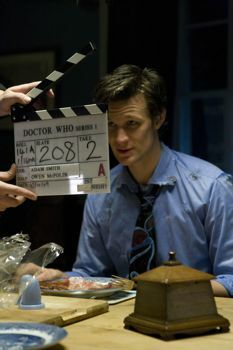 With Matt managing to look young and old all at the same time, even before he gets to his bow tie and tweed jacket. Steven was responsible for some of the darker, creepier scripts during Russell T Davies’ time as showrunner. Now that he’s taken on that role himself, you’d best have a sofa nearby to hide behind. A crack in a child’s bedroom wall plays a crucial role in the first episode. It’s a simple idea but so effective, playing with all our childhood fears. 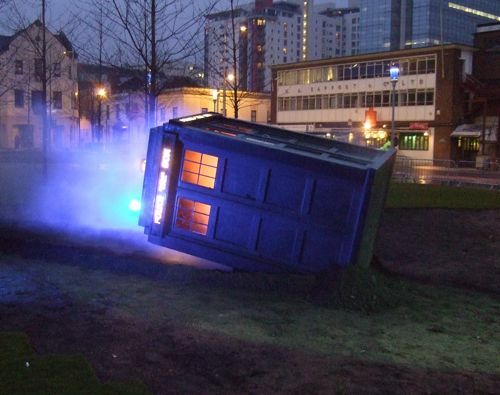 The TARDIS has been spinning out of control. In flames, it crashes into a garden. Where we get our first proper look at the still regenerating new Doctor – staring into the face of a child. Just as he will be doing in millions of homes. “I don’t know yet. I’m still cooking,” he replies. This new Doctor doesn’t know what he likes to eat – until he tastes fish fingers dipped in custard. 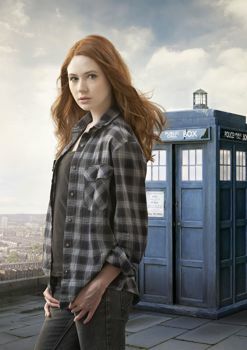 Later he meets a mini-skirted Amy Pond, beautifully played by the very sassy Karen Gillan, 22. An actress who, as you’ll see from the transcript, is confident enough to take on board the mantle of possibly the sexiest companion of recent years. The two actors spark off each other, with a more 2010, edgier feel to the way parts of the episode are shot. “Why me?” asks Amy when the Doctor invites her to travel with him in the TARDIS, complete with its all new split-level interior. Parts of the opening hour will be scary for some younger viewers, not to mention adults of a nervous disposition. There was just one moment in the 60 minutes where my attention wandered and I thought the story dragged a little. But that’s a minor complaint bearing in mind the brilliance of the majority of the episode. Including a poignant masterstroke near the end. You may disagree. But, for me, Matt, Karen, Steven and the hundreds of other people involved have given this show yet another lease of life. Below is an edited transcript of the 32 minute post-screening press Q&A. At what point did you feel you were the Doctor? How important was it that Amy was Scottish? Do you have a message for your fans in your home town of Northampton? What do you think about Cardiff? 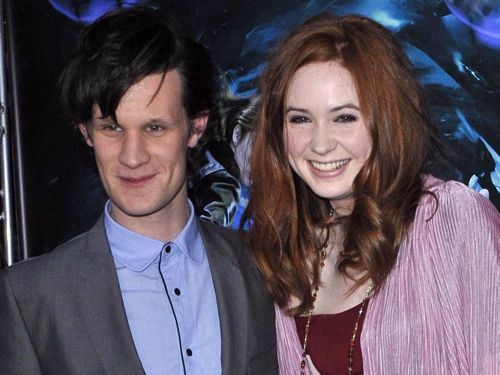 How did you get the chemistry right between the Doctor and Amy? Do you think that Amy is the sexiest assistant of recent years? And is he the sexiest Doctor of recent years? 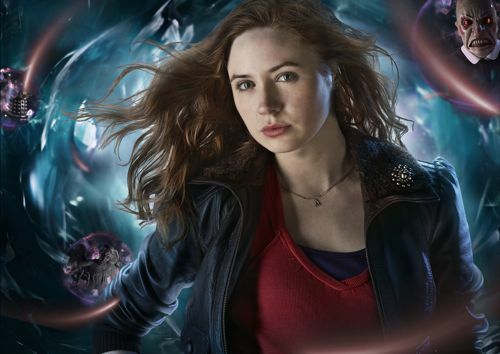 Matt – Doctor Who when you were growing up and your ambition now for how long you may be in it? How will you handle the fame and recognition that will come with these roles? Who’s the most exciting guest star in new series? 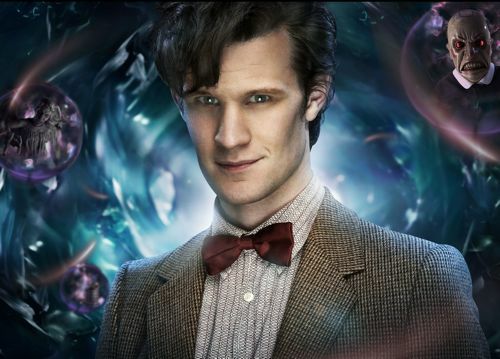 1) Matt – could you sum up your personal take on your Doctor, how you view him? 2) Steven – do you think that’s one of Doctor Who’s scariest episodes? Which scenes did you enjoy the most? Which eras of the show’s history are your personal favourties? What are you most hoping for from the reaction? What’s the best advice you were given when you got these roles? 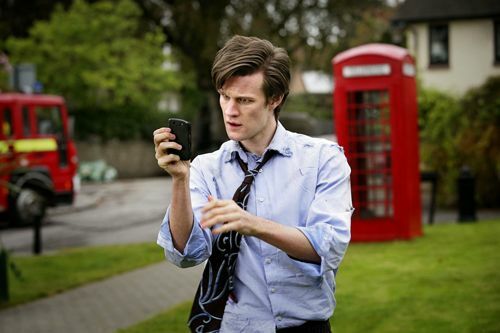 The Eleventh Hour wasn’t the first episode Matt and Karen actually filmed. What were the first scenes on the first day you had to shoot? With Richard Curtis, in particular, would you change a word of his? What feedback have you had from the fans so far and have you had any unusual requests? Did you feel extra pressure writing the script for this opening episode? What was more scary for you, Steven – watching Doctor Who as a kid or finally realising that you were the man in control? Have you had any conversations with your predecessors and, if not, is there anything you’d like to pick their brains on? Filming of this series ends of Saturday. What are your plans for the next few months? What did David Tennant actually advise you? Steven has spoken of how he was originally looking to cast and older man and then you came in with this mix of old and young? Is that how you see yourself? Do you worry that this iconic role might define your career and it might be hard for people to forget about you as the Doctor when you eventually move on? Do you actually believe in aliens yourself? Did you have any say in what your Doctor gets to wear? Is he part-librarian, part-member of JLS? Posted in Doctor Who and tagged Doctor Who, Karen Gillan, Matt Smith, Steven Moffat, TARDIS, Time Lord. Bookmark the permalink. He might eat his hat, but will he eat his fez? I mean, they’ve already conveniently chopped it up.